Nerja is well known across Spain for its beaches, with many of its coves frequently featuring amongst the candidates for the best beach in Spain. 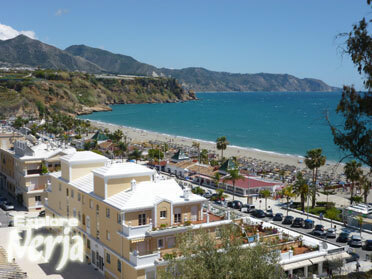 For many visitors to Nerja the only beach in their minds is Burriana however there are plenty more to choose from with quiet sandy coves, bustling tourist hubs and wide open sandy shores all in walking distance from the town centre. Indeed, there’s such a choice you could visit a new beach each day of the week if you wanted to. 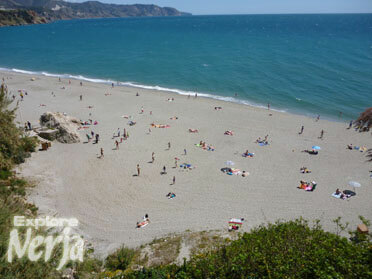 The pictures above don’t include all the beaches in the Nerja so why not take a look at our list below and click on the beach that interests you for more pictures, general information and directions on how to get there. A busy beach popular with tourists and locals alike. Here you'll find plenty of bars and restaurants with a mix of modern and traditional. Close to the center of town this is a horseshoe shaped beach just in front of the RIU Monica hotel with plenty of options for lunch. Located in the neighbouring village of Maro this beach is well know throughout Spain winning awards for its clear water and overall excellence. Located just a stones throw from the Balcón de Europa this is a nice little beach in the centre of town with lots of traditional Andalucian charachter. A long beach popular with spanish families with plenty of free parking. 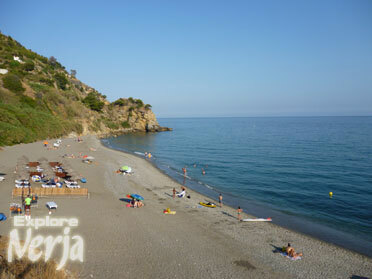 Close to the Hotel Marinas de Nerja and Hotel Perla Marina. This is a little beach that sits between El Playazo and La Torrecilla located just in front of the Hotel Perla Marina. The traditional fishermans cottages give this beach a lovely authentic feel and its location in the center of town makes it a popular option. Almost hidden from view thanks to the houses along Calle Carabeo this is a small secluded beach found close to the centre of Nerja. Located on the western end of Burriana beach, this is well maintained and popular with everybody. Often mistaken as the Hotel Balcón de Europas private beach this is actually open to the public.